tax filing, so you don’t have to. Let our virtual tax pros do your tax filing, so you don’t have to. 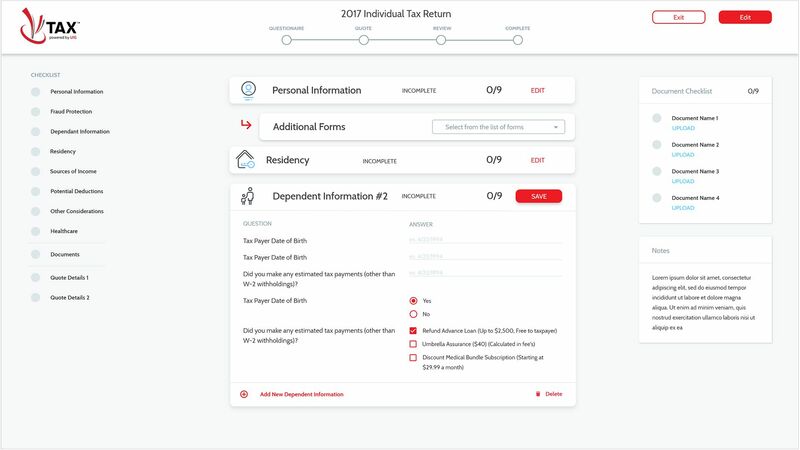 Upload your tax documents into our app and answer a few questions. Your assigned tax professional will process your taxes so that you get the highest return possible. Enjoy peace of mind knowing an expert has taken care of the hard part for you. We offer you a true concierge experience, combining the expertise of assisted tax preparation with the power of cutting-edge technology. Imagine having a friendly tax genius in your corner who’s an expert in tax credits and deductions and thinks strategically about how to get you a bigger refund, while charging you less. VTax tax professionals are always available for your questions through online chat. File online anytime, anywhere, between meetings and deadlines, while in transit or at home. You can pay your tax filing fee later, directly from your federal tax refund. We search the most up to date deductions and credits to make sure that you get the highest refund possible guaranteed! We guarantee that every piece of information included in your tax return is 100% accurate. If you have a problem with the IRS, we will pay your penalties. We offer you the option to deduct your VTax filing fees directly from your federal tax refund. You deserve to have taxes your done easily. Get your maximum tax refund guaranteed. Join 1000s of others who file smarter. Sign up & answer a few questions to get a free quote – no strings attached. It only takes a minute.